A private client is engaging Michael Singer Studio in the design of their full-time home on Cape Cod. As leaders in the field of organic tree and landscape care the clients are in the process of regenerating a 35 acre former cranberry farm, cleaning the land and water from decades of intensive pesticide use and turning it into an experimental tree farm. The one story 2,000 square foot home emerges from a subtle re-shaping of the land and a series of low terraces. The house is envisioned as a low profile glass and concrete structure, varying from reflective and transparent, to solid and heavy depending on one’s vantage point. 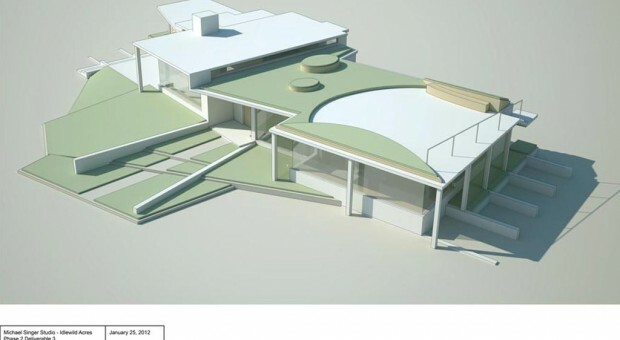 The house will be constructed from a combination of cast-in-place and precast concrete elements. Large expanses of insulated glass and deep overhangs provide a sense of openness and variation to the overall simple forms of the structure. The building is oriented for maximum winter daylight and summer shading, super insulated, and takes advantage of on-site geothermal capacity to minimize its energy consumption. Adjacent to the house and designed with relation to the tree farm, wind turbines will produce energy for on-site use. Energy modeling is integrated into the design process to ensure all openings, overhangs, systems and insulation are optimized for energy efficiency. The home is extended into the landscape through subtle planted terraces and a green roof that can be occupied in the warmer months. The project is currently in schematic design.